What is a Paso Fino? 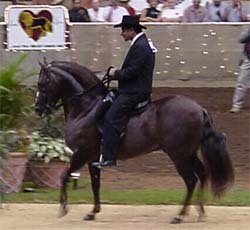 A Paso Fino is a mixture of three European breeds. The Andalusian, the Barb, and the now extinct Spanish Jennet. The Paso Fino was brought over to the Americas on Christopher Columbus second voyage. These horses came to be known as Los Caballos de Paso Fino which means "the horse with the fine step". This horse was reintroduced to the US in the 1940s. What are the characteristics of the Paso Fino? The Paso Fino has elegance, a very proud carriage, is very well proportioned, is between 13-15 hands, and has varying degress of "brio" (spirit). They are usually very willing horses, enjoy people, and are very sensitive to riding cues. What are the different gaits of the Paso Fino? The Paso Fino gait consists of three speeds: Classic Fino, Paso Corto, and Paso Largo. The classic Fino is the most collected gait with the mast rapid footfall. The speed of this gait is comparable to the walk with very fast footfall. The Paso Corto is the average trail gait. It is comparable to the trot in other breeds. The Paso Largo is the fastest speed with a longer extension. It is comparable to the speed of the canter in other breeds. The Paso Fino will also canter when asked. Their gait is very natural for them and they will exhibit the Paso Fino gait from the day they are born.